Central African governments have met to collaborate and conduct an emergency plan to stop the mass elephant killings. This is in the aftermath of the biggest episode of elephant poaching in 2013. However, does the meeting not mark an effort that is just too little, and too late? On the 14th and 15th of March, at least 86 elephants were slaughtered in Chad, near the Cameroon border. This included over 30 pregnant females. Even more sickeningly, the calves were then shot, or just left to die. 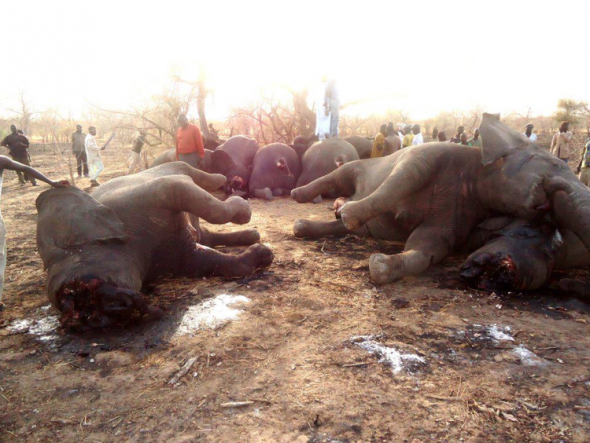 This image reveals the elephant carcasses that were left after the shocking and sickening massacre of March 14- 15. Photo courtesy of SOS Elephants. This massacre, whether incidentally or accidentally, took pace during the closing hours of the Convention of International Trade in Endangered Species (CITES) conference meeting, where elephants were high up on the agenda. This massacre occurred just weeks after 28 elephant carcasses, with all their ivory tusks removed, were discovered in the Lobeke and Nki National Parks of Cameroon. There were also at least 15 carcasses in four different locations across the Central African Republic. These massacres all followed a number of reports of Sudanese poachers that were crossing over CAR and heading towards Chad and Cameroon. Both the governments of Chad and Cameroon responded to this warning, but neither could find and stop the poaching gangs. This crisis was acknowledged and a three-day emergency meeting on the poaching of elephants was held Yaounde, Cameroon from March 21 to 23. The Economic Community of Central African States (CEEAC) organized the meeting. The meeting’s participants were made up of ministers of foreign affairs, defense and wildlife protection, it also included representatives from organizations such as the SOS Elephants and the World Wildlife Fund, as well as representatives from the United Nations Development Program. The final declaration realised that national initiatives taken to combat illegal trafficking and poaching had failed. It emphasized that countries involved in the ivory supply chain (whether in origin, transit, or destination) need to coordinate efforts so to stop the transnational, organized crime networks operating throughout the region. The plan was adopted in extreme urgency to combat poaching. It includes: the mobilization of military forces in Cameroon and Chad to support the anti-poaching brigades; the exchange of intelligence regarding the movement of the poachers; a mechanism for inter-state coordination and the initiation of national coordination units; an implementation of a tripartite agreement that allows for the intervention of multi-country brigades; and criminalizing poaching and the illegal ivory trade, so that penalties equal those of organized transnational crimes. This is inside the CEEAC emergency meeting. Photo courtesy of SOS Elephants. Internationally, penalties for wildlife crimes are known to be especially low. For example, in Ireland on March 19, two rhino horn dealers were each fined $650 for smuggling eight rhinos. The horns themselves were valued at $650 000 on the black market. This CEEAC meeting plan realises and acts for the larger actions taken against elephant poaching, namely: the need for transnational, coordinated efforts, the need to treat elephant and other wildlife killing and the illegal trade in ivory and other wildlife parts as severe crimes; and a call for effective enforcement through prosecutions, harsher penalties, and advanced operational techniques to curb the illicit trade. There is still a need in financing the implementation of the CEEAC emergency plan, as well as for longer-term actions. A $2.3 million budget and timetable of actions were laid out, however, there is still an unclear status of financial commitments. The final declaration of the meeting was for a call for the global community and other partners to come forward and offer money. 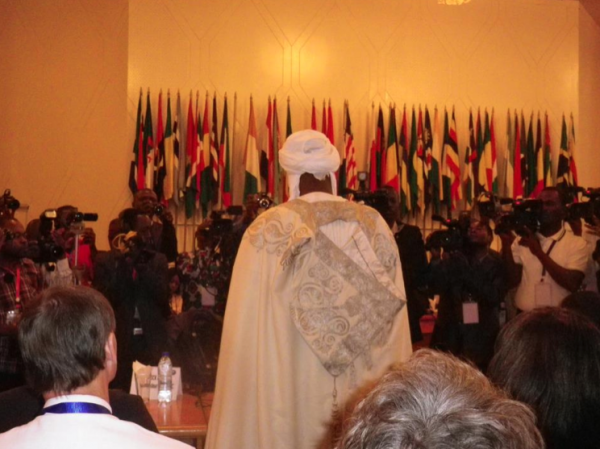 There is still lingering political instability in the CAR. Very recently, rebels seized the capital and President Francois Bozize` fled the country. This turmoil implies that poachers would be able to continue to roam the CAR with freedom and a sense of immunity. There have been sightings of the Sudanese poachers from the air and from the ground. The poachers seem to have broken into smaller groups of 10 to 15 members each, and are widely dispersed. However, the exact locations and particular movements of the poachers in Cameroon and Chad are unconfirmed, and the reports do not seem to be entirely accurate. 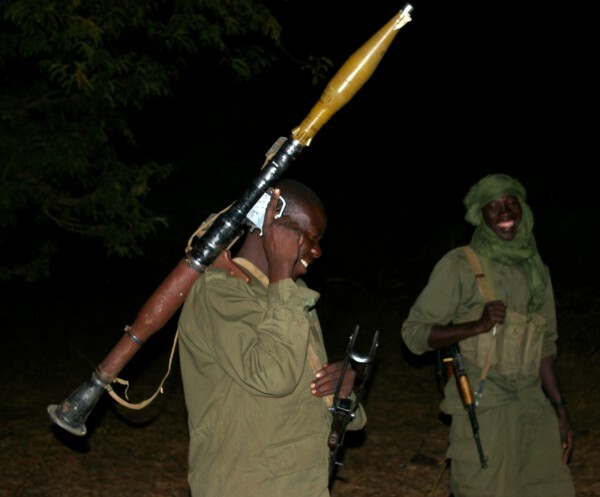 The Chadian troops have already been pursuing poachers. The Chadian President has deployed a many troops to hunt the poachers, and is determined to catch them before they leave Chadian territory. There has been a violent and vehement exchange of gunfire between the regular army in Loumobogo, near the CAR, and groups of poachers. The authorities have seized 30 tusks, and Chad is reportedly ready to declare a total war on the poachers. These are brave troops of the Chadian anti-poaching forces. Photo courtesy of SOS Elephants. Tens of thousands of elephants have become the victims to a storm of high ivory prices that are driven by a soaring Chinese demand. The elephants are left to be even more vulnerable due to the low risk of traffickers getting caught, and menial penalties for those who are caught. There is also a lack of priority at local and political levels to act seriously enough against elephant poaching. 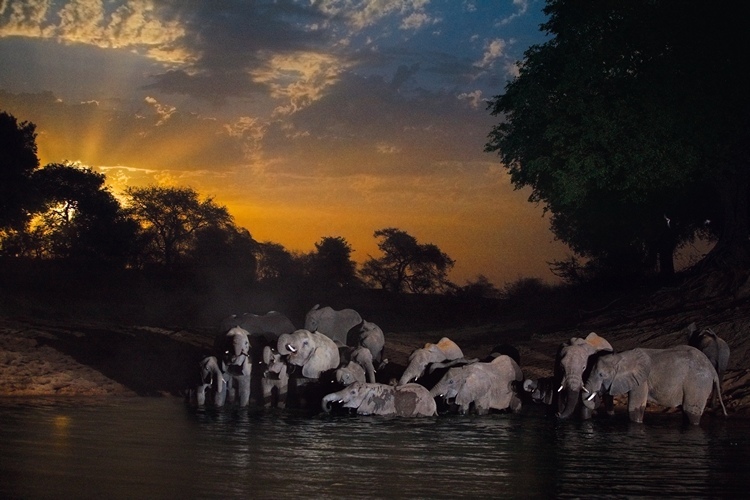 Chad is encouragingly actively pursuing the poachers, however, the situation in the CAR and Cameroon remains less clear. The bottom line remains as the Sudanese poachers still out there, and still relentlessly and ruthlessly hunting.